Our team has just returned from Scarborough Sea Life and Marine Sanctuary and had a great time chatting to all the visitors. The centre has a long history of rescuing and rehabilitating animals and our message of seafloor research and protection fitted in perfectly. We were excited to see the show advertised in the local paper and on local road signs, and would like to thank all those in Scarborough for making us feel welcome. Trying to be an ancient deer. We had a mixture of school groups and families visiting us and they were all excited to see our ‘Please touch’ signs. Many of our visitors were from Scotland as the roadshow coincided with the Scottish school holidays. This was an excellent opportunity to reach a new audience and explain to them what the English seafloor is really made of. Next stop, Weymouth!! This roadshow will be held from the 24th of July to the 2nd of August. See you there. Sneaking a peak at the Brighton Roadshow. the amazing things that can be found. The visiting school groups came up with excellent suggestions for where the archaeological artefacts could have been from and produced some colourful postcards which can be viewed here. After a quick turn around the van is on its way to Scarborough. This roadshow is hosted by Scarborough Sea Life and Marine Sanctuary and will focus on the seafloor studies in the Humber region. If you are in the area drop on by and chat to our enthusiastic team or get hands on and explore the activities yourselves. The Scarborough roadshow will run from the 3rd of July to the 11th. 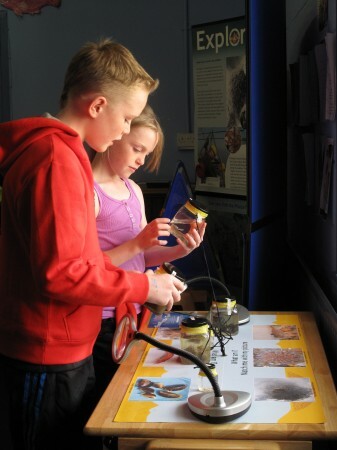 This Sunday June 6th 2010 the Explore the Seafloor Roadshow will be at Newhaven Fort in Sussex. The Fort, built in the 1860’s, is hosting an event day with community groups joining in the fun to raise awareness of local projects. 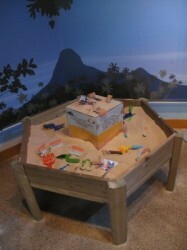 The Explore the Seafloor team will be on site all day with a range of hands-on activties for you to try. Come and hold real archaeological finds from below the waves, meet some of the creatures that live off of the South Coast and see if you are brave enough to explore our mystery deep sea feelie boxes. For more information on finding the Fort and the opening hours, visit Newhaven Fort’s website. Our first Roadshow finished on Sunday after a hugely successful week. 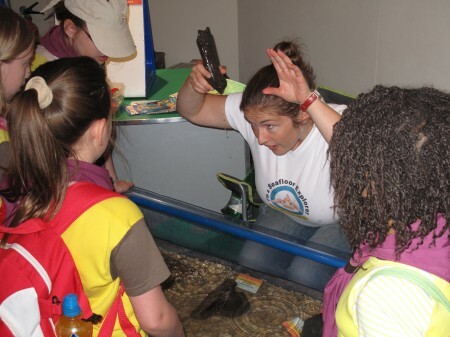 Nearly 25,000 people met our staff at London Aquarium and Explored the Seafloor for themselves, getting hands on and up close to the fascinating undersea world of the Thames Estuary. Our visitors really enjoyed being able to touch artefacts from under the sea and learn about animals and their habitats. Many were surprised to learn that undersea areas around Britain today were once dry land where mammoths roamed and huge rivers gouged out deep channels, now visible on the seafloor. 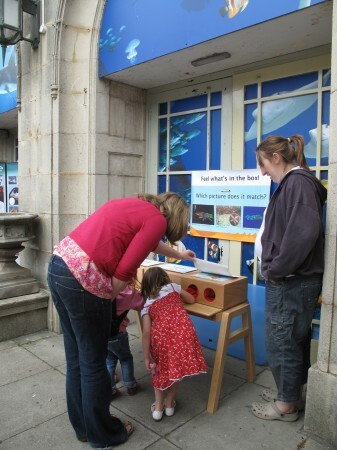 The touch boxes were a great hit but lots of adults were too scared to put their hands in! Our team are hard at work preparing for the next Roadshow, which explores the archaeology, ecology and geology of the South Coast. 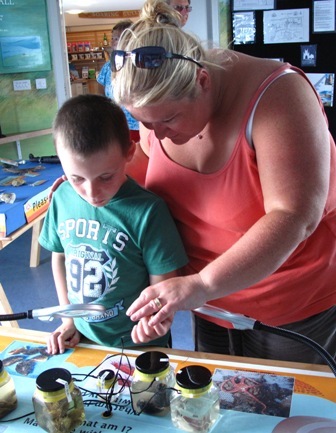 Explore it for yourself at Brighton Sea Life centre between the 19th and the 27th June.